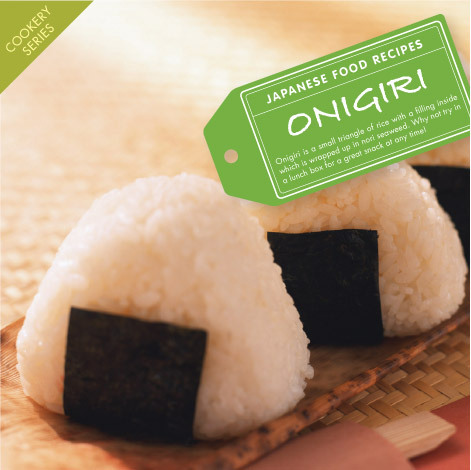 Onigiri are balls of rice usually wrapped with nori seaweed and have a meat or vegetable filling. Much like sandwiches in the West, onigiri are readily available in convenience stores accross Japan and are great for a quick and easy snack. The sticky rice is usually shaped into triangles or cylinders by hand or using a plastic mould. Aesthetically pleasing and really tasty, they are a healthy and suprisingly filling alternative to sandwiches for your lunchbox. 1. Begin by cooking the Japanese rice according to our sticky rice recipe. 2. With a small amount of salt sprinkled on your hands, mould the rice into small balls or triangles approximately 8cm wide. 3. Create a small hole in the centre of the rice and put in your choice of ingredients. 4. Using a sheet of nori seaweed, wrap up your ball of rice. 5. Sprinkle some sesame seeds or cut up shiso leaves on the rice for a little extra flavour (optional). 6. Your onigiri is now ready and will be a perfect addition to your bento lunch box! It is important to use Japanese sticky rice when you make onigiri so that the rice stays together in a triangle. You can use any type of ingredients when you make onigiri, try some different varieties and see which one you like the most. Delicious!! Thanks for the recipe, it was a hit, and I’ll be using it again for sure! Matcha vs Sencha: Know Your Green Teas!